The worst drought in 50 years has brought water levels in the Mississippi River close to historic lows, and could potentially shut down all shipping in a matter of weeks. This is the second extreme event on the river in 18 months, after the flooding in the spring of 2011 forced people to flee their homes. 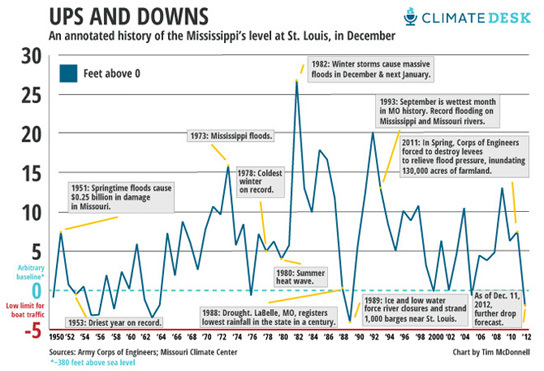 Without any rainfall, the water levels on the Mississippi are projected to reach historic lows this month, states the NOAA. The drought has created a low-water choke point south of St. Louis, near Thebes, were pinnacles of rock extend upwards from the rover’s bottom, making any passage dangerous. This has caused shipping companies to haul 15 barges at a time instead of the typical 25. Bigger runs are too big for the current operating conditions. The barges are also being sent off with a lighter load, which makes for more traffic and delays. Stretches of the river are reduced to one-way traffic. A long cold spell could make things even trickier. Shallow, slow-moving water is more likely to get clogged up by ice. Water levels could drop too low to send barges through Thebes before the new year, unless there is heavy rainfall. The economic consequences of a shut-down would be devastating. $7 billion in vital commodities moves on the river at this time of year. Cement, coal, grain products, steel, chemicals, petroleum plants, and heating oil are all moved on the waterway. Farmers will be especially hard hit because they might not be able to sell their grain, since they will not be able to get it to market and items they need, like fertilizer, are also shipped on barges. Extra water could be released from the Missouri River, allowing for the Army Corps of Engineers to blast and clear the series of rock pinnacles down river, near the town of Thebes, that threaten the barges. But this could doom states upstream, like Montana, Nebraska, and South Dakota, which depend on water from the Missouri. Scientists believe that rivers are headed for an era of extremes, because of climate change. This time last year, the Mississippi was about 20 feet deeper around St. Louis because of heavy rain. In 2011, the Army Corps of Engineers blew up two miles of levees to save the town of Cairo, Illinois and Missouri farmland, and deliberately flooded parts of rural Louisiana to make sure that Baton Rouge and New Orleans stayed dry. Over the decades, Congress has funded a number of projects to deepen the shipping channel, doubling its depth to 9 feet, and building an elaborate system of locks and dams to keep the river in a confined space. The Army Corps of Engineers is constantly dredging the river’s sandy bottom or building new levees to keep the barges moving. These efforts are believed to have made the surrounding areas more vulnerable to extreme floods. 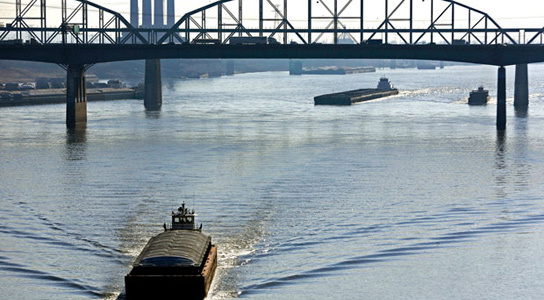 Be the first to comment on "Low Water Levels Could Shut Down Mississippi River Shipping Lanes"